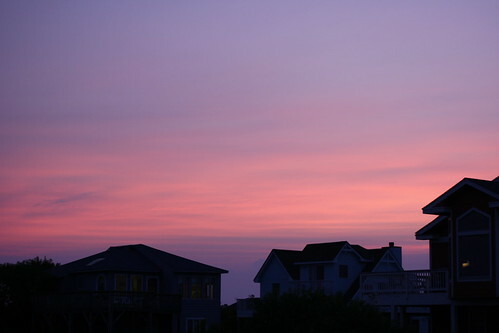 I really like the Outer Banks. Despite the drive down to North Carolina taking 6 or 7 hours, it’s still better than Ocean City, Maryland. There are no crowds. No hotels. No drunken high school graduates. No tag checks on the beaches. Not a lot of enforcement on the beaches, either. The life guards in the Outer Banks are content to let you do what you want to do. It’s quiet and peaceful and out in the middle of nowhere. Having been down a dozen or so times, I tried to take a few photographs to explain what it is exactly that I enjoy about the Outer Banks. Short of the occasional fisherman, the beaches are barren in the morning. Perfect for long walks before it gets too warm out. 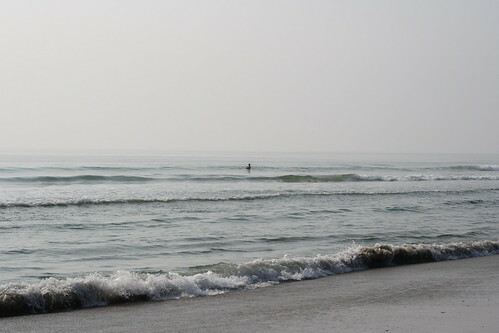 Or for an early morning date with the waves. 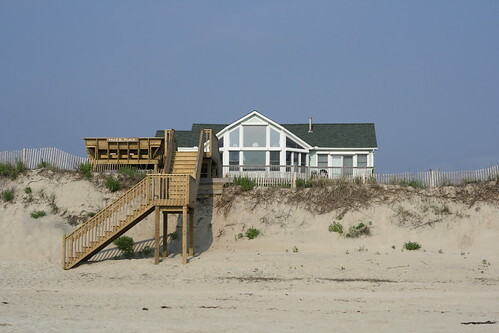 Whether you’ve got shared set of stairs or a private entrance, beach access is easy. There’s no highways to cross, no boardwalk full of people. The only thing between you and the beach is a dune. 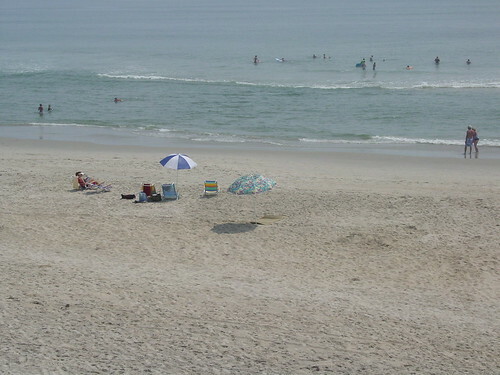 At 10am, the beach is uncrowded. Better yet, it stays uncrowded throughout the day. No stepping over other people’s towels or having people accidentally kick sand on you as they try to pass through. There’s no squishing people into the water between jetties. There’s some 200 miles of coastline here, which is more than enough room for everyone. The houses have an untold number of windows and decks with views. Even if you’re stuck inside for an hour while fixing lunch or you’re just sunburned from the day before and have vowed to stay indoors for a day, it still feels like you’re on vacation. 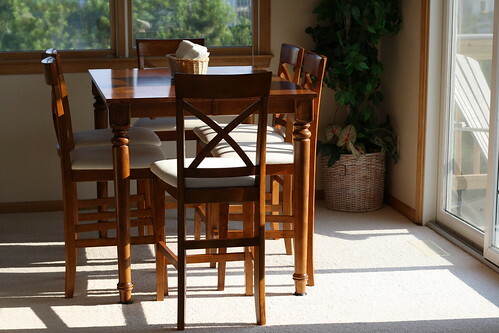 Whether it’s the living room, kitchen, or a cozy breakfast nook, you get to bathe yourself in natural light all day long. The decks are perfect for watching the sun go down, unobstructed by tall buildings. And in the dead of night, it’s quiet save for the sound of the waves rolling onto the shore. It’s dark, too. There’s no glaring light from surrounding businesses or commercial industries. 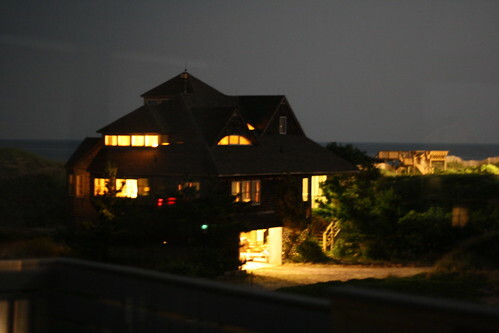 The only light is the warm glow from the surrounding homes and the phosphorescence of the ocean beyond. Yessssss. I’m headed down there in a few weeks, and I cannot wait.